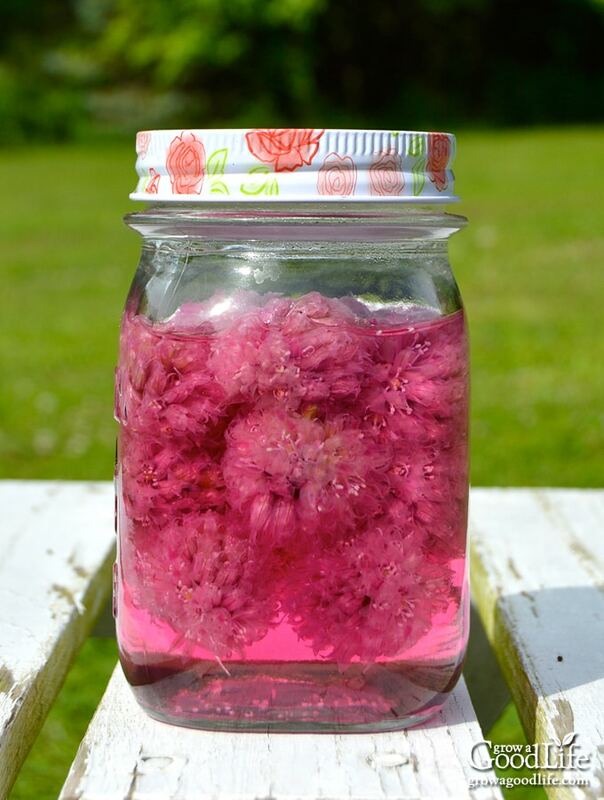 Make your own chive blossom vinegar. See how easy it is to infuse vinegar with a subtle onion essence and a purple blush of color. The chive plants are in full bloom right now. In addition to the two clumps growing in the garden, I have at least six different clusters around the property. The majority of these extra plants are self-sowed and pop up in unexpected places at the edges of the yard. Most often the only way I know they are there is when I see as splash of color when their purple orb flowers bloom this time of year. The pollinators love the blossoms and I often leave the flowers to mature, go to seed, and surprise me again next season. Chive blossoms are edible and have a mild onion flavor that compliments any dish that you would use onions in. I often snip apart the florets and add to scrambled eggs or sprinkle them in a green salad. They add a nice subtle onion essence and a purple pop of color. Another way I enjoy chive blossoms is infusing them into chive blossom vinegar. Step 1: Harvest healthy chive blossoms by snipping off the blossoms. Step 2: Give the blossoms a quick rinse to flush out dust and insects. Spread them out on a clean kitchen towel to dry. Step 3: In a small saucepan, warm vinegar over medium low heat to a simmer (not boiling). Turn off heat. Step 4: Pack the chive blossoms loosely into a clean pint jar. Step 5: Pour the warm vinegar over the chive blossoms leaving about a 1-inch space at the top of the jar. 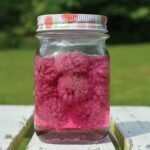 Cover the jar and store in a dark, cool location for 3-4 days to allow the chive blossoms to infuse flavor and color into the vinegar. Step 6: Once the vinegar has infused and turned a lovely shade of purple, strain out the blossoms and store vinegar in a clean glass jar or bottle. Ways to Use Chive Blossom Vinegar: Use chive blossom vinegar in marinades, salad dressings, drizzle on roasted vegetables, and substitute for any recipe where you would vinegar. Try this Mason Jar Chive Vinaigrette Salad Dressing. Use chive blossom vinegar in marinades, salad dressings, and wherever you would normally use vinegar. It makes a lovely hostess gift too. 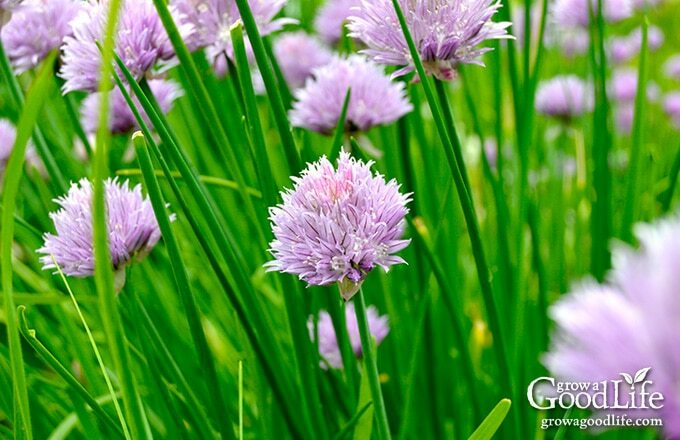 Rinse the chive blossoms in water and spread them out on a clean kitchen towel to dry. In a small saucepan, warm vinegar over medium low heat to a simmer (not boiling). Turn off heat. 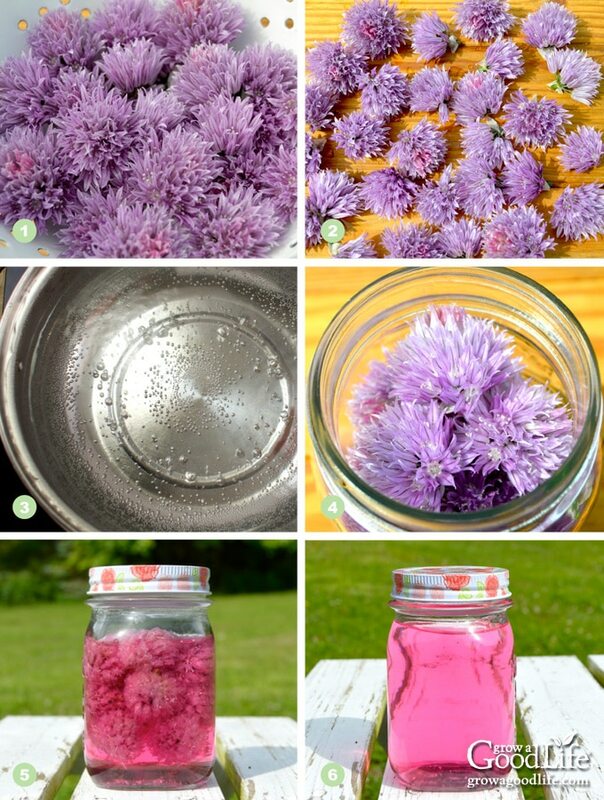 Loosely pack chive blossoms into a clean glass pint jar. 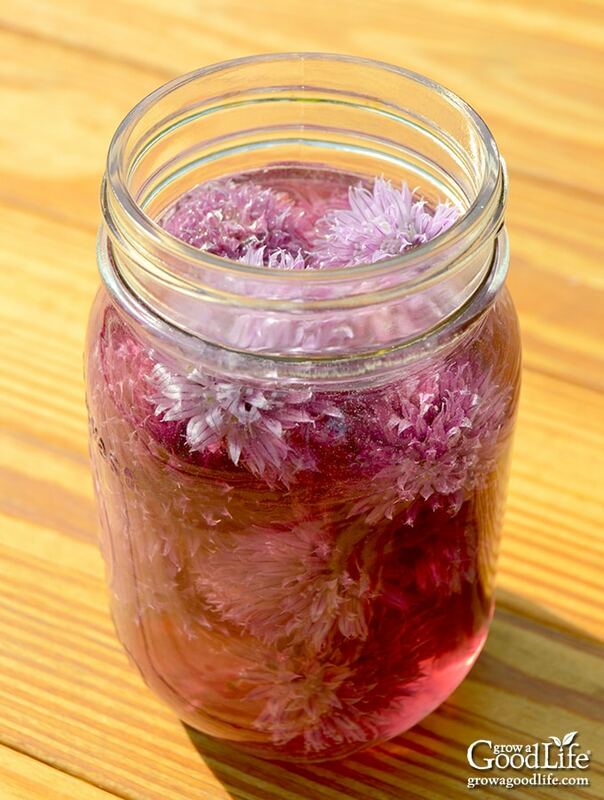 Carefully pour warm vinegar over chive blossoms leaving about a 1-inch space at the top of the jar. Cover the jar and store in a dark, cool location for 3-4 days. 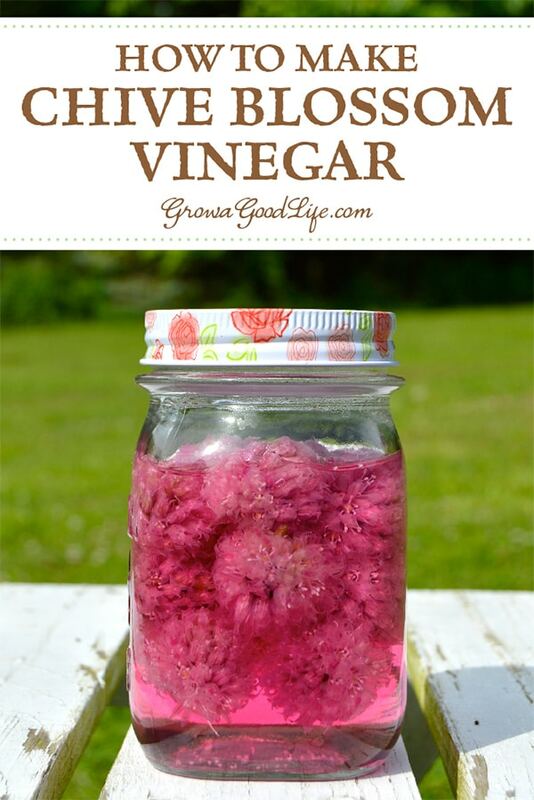 Once the vinegar has infused and turned a lovely shade of purple, strain out the blossoms and store vinegar in a clean glass jar or bottle. Compost the spent chive blossoms. Great ideas here. I don’t have chives right now but I would like to grow them again. Congrats for having a featured post at Wildcrafting WEdnesday. Pinned this one too! I didn’t know we could eat chive blossoms! Thanks for sharing on the Homestead Blog Hop! This recipe is so amazing. I can’t wait to make your Chive Blossom Vinegar Infusion and enjoying it in my salads and marinades this summer. Thanks for sharing it with us on the Healthy Happy Green and Natural Party Blog Hop. I’m pinning and sharing. How long will the vinegar last? 4ever? We usually only snip enough blossoms to use in Sunday scrambled eggs, because I love to see the flowers out in the yard. Thanks for sharing this with Green Thumb Thursday! My chives are in bloom right now so I’m going to try this! I’m so glad you stopped by and saw your featured post today! I’m a little behind on comments this week! Just a note to let you know that I have chosen your post as one of features for this weeks Real Food Fridays blog hop. Thanks for sharing and being part of Real Food Fridays. Look forward to seeing your post each week. I love to make my own flavored vinegars, but I’ve gotten out of the habit. Chive blossom is not one I would have thought about doing. You’ve inspired me to start again. Now I just need to cook more! Thanks for stopping by Front Porch Friday, we’re featuring your post this week. Thank you so much for linking up to Merry Monday this week! I am sharing your post today on Pinterest! We hope to see you next week for another great party! Have a great week! Wow! This is a really great idea! Going to have to try it! I love making my own vinegars and pickles! What a wonderful recipe and its sounds so simple to do. This has to taste wonderful on a salad. thanks for sharing on Real Food Fridays. Pinned & twitted. What a great idea. I usually just toss chives in a salad. But the blossoms are so pretty in the vinegar, I’m going to try this. Chris, I am not a big fan of sliced onions in my salad, but I do like the flavor. So adding a mild onion flavor to the vinegar is a win. Oh I’m going to have to try this, those blossoms always look so lovely that I love the idea of letting them self seed to pop up at various places around the yard with their lovely blossoms.